Shiva, the third god of the Hindu triad, has three eyes, the third one (between the eyebrows) being usually closed, except at the time of destruction of things. He wears long hair, supports the holy Ganga River on his head and the crescent moon on his matted hair. He has two to four arms, holds a trident in his hand, is naked except for a tiger-skin, besmears himself with ash and is decorated with snakes on his head, neck and arms. He is very fair-coloured but has a blue throat due to his having drunk poison during the time of the churning of the ocean by the gods. In his other hands he holds an axe, an antelope, and an hour-glass shaped drum called a damru. He wears a garland of skulls and is also known as the lord of the cremation grounds. His consort is Parvati and he is the father of Ganesha and Skanda (Kartikeya). His vehicle is the bull called Nandi. Shiva was not a Vedic god and in his earlier forms he was known as Rudra. In contrast to Vishnus reputation as the benevolent creator god, Shiva represents destruction, austerity and the more malignant forces of life. This divergence has the effect that whereas Vishnu manifested himself through avataras, Shiva is represented by different aspects of his own powers and that of his consort. 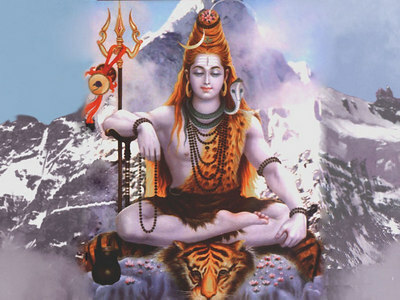 Shiva is called the Destroyer (of evil), but has also the aspect of regeneration. As destroyer he is dark and terrible, appearing as a naked ascetic accompanied by a train of hideous demons, encircled with serpents and necklaces of skulls. As auspicious and reproductive power, he is worshipped in the form of the shivling or Shiva linga (lingam). Shiva is depicted as white, with a dark-blue throat, with several arms and three eyes. He carries a trident and rides a white bull. His consort is Parvati (Devi). The common thread of thought in the religious beliefs of the Indian subcontinent upholds a single Reality (as in absolute monism) and holds in reverence each of the several manifestation of the Ultimate Reality in the forms of Gods. Bhrama, Vishnu and Shiva are revered as the Supreme Trinity of multitude of manifestations of Divinity. It is said that all that is true, all that is good and all that is beautiful is God (Satyam Shivam Sundaram). Shiva is referred to as 'the good one' or the 'auspicious one'. Shiva - Rudra is considered to be the destroyer of evil and sorrow. Shiva - Shankara is the doer of good. Shiva is 'tri netra' or three eyed, and is 'neela kantha' - blue necked (having consumed poison to save the world from destruction. Shiva - Nataraja is the Divine Cosmic Dancer. Shiva - Ardhanareeswara is both man and woman. He is both static and dynamic and is both creator and destroyer. He is the oldest and the youngest; he is the eternal youth as well as the infant. He is the source of fertility in all living beings. He has gentle as well as fierce forms. Shiva is the greatest of renouncers as well as the ideal lover. He destroys evil and protects good. He bestows prosperity on worshipers although he is austere. He is omnipresent and resides in everyone as pure consciousness. The five mantras that constitute Shiva's body are Sadyojaata, Vaamadeva, Aghora, Tatpurusha and Eesaana. Eesaana is Shiva not visible to the human eye, Sadyojaata is Shiva realized in his basic reality (as in the element earth, in the sense of smell, in the power of procreation and in the mind). The Vishnudharmottara Purana of the 6th century CE assigns a face and an element to each of the above mantras. (Sadyojaata - earth, Vaamadeva - water, Aghora - fire, Tatpurusha - air and Eesaana - space). The names of the deified faces with their elements are Mahadeva (earth), Bhairava (fire), Nandi (air), Uma (water) and Sadasiva (space). Panchamukha lingams have been seen from the 2nd century onwards. The Trimurthi Sadasiva image of Shiva in the Elephant Caves near Mumbai is a portrayal in stone, of the five faces of Shiva. The fourth and the fifth heads are not seen in this image here. The works of sages Vyasa, Vasishta, Patanjali, the poet Kalidasa, the tamil saint poets Nayanmars - Appar, Sundarar, Sambandar, the poet Manikkavachakar, the mystic tamil siddhas, tantric philosophers, the spiritual leader Adi Sankaracharya and others such as Basavanna and Appayya Deekshitar speak of the attributes of Shiva.